Our party consisted of our son and new wife for their honeymoon, along with my husband and myself who are cruisers (23 for me and 18 for DH); it was our son&apos;s third cruise and his wife&apos;s second (first on Carnival for both of them). Cabin was Balcony 8215 located below the Lido Deck, One could hear rolling carts across the floor in the Mermaid&apos;s Grille above us from time to time since parts of it are open 24 hrs. and continental breakfast was available at 6 am. I had made purchases online prior to embarkation for the newlyweds and a case of bottled water. All items were in the cabin upon arrival or delivered at the specified time. The previous cruise was late arriving back to Baltimore and our original time frame to arrive requested by Carnival via email was 1-2 pm but it was changed to 2-3 pm. We had a 5+ hour drive from north of Pittsburgh to the port of Baltimore and arrived in the parking area around 1:30. 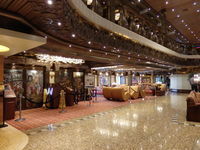 Lot employees and porters operate very proficiently at this port which we had sailed from previously on Royal Caribbean. Apparently, all embarkation was delayed significantly as we had a 45 minute wait in line to check in, with only Diamond/Platinum level enjoying a short line or FTTF passengers who had a separate check-in point. There were about 28 agents checking people in. We were able to go directly to our cabin upon arrival which was great since we had brought soda and wine that is allowed to be brought on and we all had multiple carry-on items. We had received all but one piece of luggage within 30 minutes. We then went to the Mermaid&apos;s Grille for lunch and the final bag had arrived when we returned. After sailaway, we enjoyed time out on deck viewing the sunset and the Chesapeake Bay Bridge prior to dinner. We were assigned a table for four at the late sitting in the MDR. Our waiter&apos;s name was Nevlin and stateroom steward was Sutopo. They looked after us very well and were excellent. The ship itself is laid out well with few bottlenecks except at the Mermaid&apos;s Grille. Many public rooms are underused. The Ivory Piano Bar is gorgeous but was not used much. The refurbished Lido Deck is definitely a popular spot with several bars and eateries, along with the movie screen, being fully utilized. Our son booked dinner in David&apos;s Steakhouse ($35pp charge specialty restaurant) on the second at sea night. It is worth the fee and also, you need to allow additional time for additional courses. 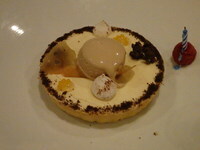 Everyone there gave excellent service and the food was superb. They even made a special dessert treat for the honeymooners with a candle to blow out. 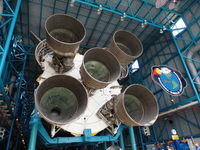 Excursions - We had booked two excursions through Carnival prior to sailing - Kennedy Space Center (KSC) self-guided tour in Port Canaveral and the Scenic Underwater Bubble (SUB) in Nassau and our tickets arrived for these embarkation day. We left for the KSC tour around 8 am and the bus for the return to the ship left the Visitor&apos;s Complex at 3:30 pm. Our DIL has mobility issues with her knees and cannot stand or walk far at one time (this became very evident while waiting in the embarkation line) so I made arrangements to rent a wheelchair from Carnival as I knew the KSC was a large facility and would involve lots of walking. KSC provided buses from the Visitor&apos;s complex to the launch pad area, so employees requested special handicap lift buses for our DIL. Unfortunately, this necessitated additional wait times. 7-8 hours is minimal time to see the complex, but it is worth seeing; I recommend seeing it over two full days and not as an excursion from a cruise. Disney in Orlando was even further away from the port and the only other thing to do there is go to a beach. Our other excursion which only my husband and I took (we are avid snorkelers) was the SUB. The weather was liquid sunshine and since we were going underwater, that was OK, except all our stuff including towels got soaked in a driving rain while taking the "speedboat" out to the snorkel boat. Once on board, we were divided into two groups: one to go on the SUBs and the other to snorkel. Then the two groups switched, although not many wanted to snorkel after doing the SUB. Several people in the first group declined to go in the water or came out immediately after getting in the SUB - unsure of the reasons. I was the last in the first group and the steering on my equipment was not functioning so I would continue to spin in a circle. Then one of the crew guided me around following the leader and the others. Both my husband and I were VERY PLEASED with the overall excursion and can&apos;t wait to do it again. A buoy attached to the SUB keeps everyone exactly 15 feet below the surface and your head remains dry. Our last port excursion at Freeport, Bahamas, offered a pleasant surprise. Our son had never snorkeled and is not a very good swimmer, but he wanted to try, so we booked an independent excursion through Viator to snorkel from the beach at Paradise Cove (Deadman&apos;s Reef). While my DH was helping our son learn how to use the equipment along with employees at the beach, I started swimming out to the reef. For a non-swimmer, it is a great distance and the equipment for flotation was not a vest, but a belt; our son did get to see a couple of small fish swimming close to the shore while standing on sand. It was low tide when we arrived and I had never snorkeled so close to the coral and fish as my underwater photos can attest to. I saw several turtles and a spotted ray probably 4-ft. in span with an even longer tail/barb, along with the usual assortment of fish and coral. For me, this was my best snorkeling adventure ever, due to the proximity to everything. Entertainment - For late diners, options for entertainment were minimal; we do not frequent comedians which seems to be a typical Carnival show. The 80s show was not good in our opinion. We also are not bingo players or interested in hairy chest contests, etc., so activities we enjoy were not plentiful. The Serenity Deck is too small for the number of people wanting to use it and when we ventured there, there were really no chairs available (some chair hogs, but not a lot). Also the hot tub could not handle more than 7 people. There were 15-20 children on board to attend the camps/clubs. There was a medevac on our last sea day which put us behind in time to arrive in Baltimore. 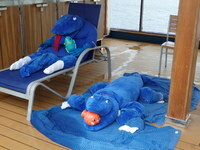 I never made it to the gym, but did enjoy a massage at a reduced price on the last sea day and I had purchased an OBC prior to sailing for our DIL to get a massage also - she enjoyed hers as well; however, we started to experience rocky seas and the spa is located forward on deck 9 (Lido). She experienced seasickness and did not go to dinner. Our arrival time was pushed back until 11 am into the port (I am sure the succeeding cruise experience at least a two hour delay with embarkation as well). We asked for wheelchair assistance for our DIL for debarkation, but were waiting until after 12:45 pm before being escorted off based on the location of cabin by deck - I found this to be a very unsatisfying way to disembark. Handicap assistance followed platinum/diamond pax, then FTTF, self-assist people, who took an hour total. Driving away from the port was very easy and we were on the road before 1:30 pm. Would I sail on the Pride again? - Probably if a different itinerary. Would I sail from Baltimore again - absolutely! Our party consisted of our son and new wife for their honeymoon, along with my husband and myself who are cruisers (23 for me and 18 for DH); it was our son&apos;s third cruise and his wife&apos;s second (first on Carnival for both of them). 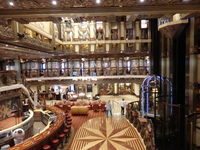 Cabin was Balcony 8215 located below the Lido Deck, One could hear rolling carts across the floor in the Mermaid&apos;s Grille above us from time to time since parts of it are open 24 hrs. and continental breakfast was available at 6 am. I had made purchases online prior to embarkation for the newlyweds and a case of bottled water. All items were in the cabin upon arrival or delivered at the specified time. The previous cruise was late arriving back to Baltimore and our original time frame to arrive requested by Carnival via email was 1-2 pm but it was changed to 2-3 pm. We had a 5+ hour drive from north of Pittsburgh to the port of Baltimore and arrived in the parking area around 1:30. 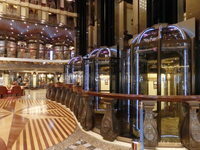 Lot employees and porters operate very proficiently at this port which we had sailed from previously on Royal Caribbean. Apparently, all embarkation was delayed significantly as we had a 45 minute wait in line to check in, with only Diamond/Platinum level enjoying a short line or FTTF passengers who had a separate check-in point. There were about 28 agents checking people in. We were able to go directly to our cabin upon arrival which was great since we had brought soda and wine that is allowed to be brought on and we all had multiple carry-on items. We had received all but one piece of luggage within 30 minutes. We then went to the Mermaid&apos;s Grille for lunch and the final bag had arrived when we returned. After sailaway, we enjoyed time out on deck viewing the sunset and the Chesapeake Bay Bridge prior to dinner. We were assigned a table for four at the late sitting in the MDR. Our waiter&apos;s name was Nevlin and stateroom steward was Sutopo. They looked after us very well and were excellent. The ship itself is laid out well with few bottlenecks except at the Mermaid&apos;s Grille. 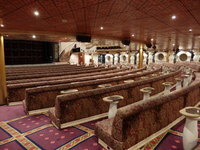 Many public rooms are underused. The Ivory Piano Bar is gorgeous but was not used much. 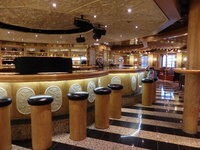 The refurbished Lido Deck is definitely a popular spot with several bars and eateries, along with the movie screen, being fully utilized. 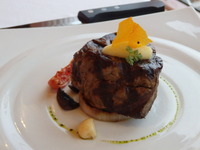 Our son booked dinner in David&apos;s Steakhouse ($35pp charge specialty restaurant) on the second at sea night. It is worth the fee and also, you need to allow additional time for additional courses. Everyone there gave excellent service and the food was superb. 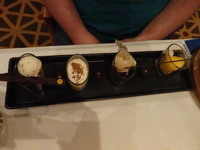 They even made a special dessert treat for the honeymooners with a candle to blow out. 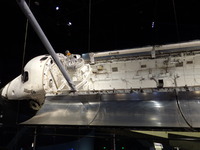 Excursions - We had booked two excursions through Carnival prior to sailing - Kennedy Space Center (KSC) self-guided tour in Port Canaveral and the Scenic Underwater Bubble (SUB) in Nassau and our tickets arrived for these embarkation day. We left for the KSC tour around 8 am and the bus for the return to the ship left the Visitor&apos;s Complex at 3:30 pm. Our DIL has mobility issues with her knees and cannot stand or walk far at one time (this became very evident while waiting in the embarkation line) so I made arrangements to rent a wheelchair from Carnival as I knew the KSC was a large facility and would involve lots of walking. KSC provided buses from the Visitor&apos;s complex to the launch pad area, so employees requested special handicap lift buses for our DIL. Unfortunately, this necessitated additional wait times. 7-8 hours is minimal time to see the complex, but it is worth seeing; I recommend seeing it over two full days and not as an excursion from a cruise. Disney in Orlando was even further away from the port and the only other thing to do there is go to a beach. Our other excursion which only my husband and I took (we are avid snorkelers) was the SUB. The weather was liquid sunshine and since we were going underwater, that was OK, except all our stuff including towels got soaked in a driving rain while taking the "speedboat" out to the snorkel boat. Once on board, we were divided into two groups: one to go on the SUBs and the other to snorkel. Then the two groups switched, although not many wanted to snorkel after doing the SUB. Several people in the first group declined to go in the water or came out immediately after getting in the SUB - unsure of the reasons. I was the last in the first group and the steering on my equipment was not functioning so I would continue to spin in a circle. Then one of the crew guided me around following the leader and the others. Both my husband and I were VERY PLEASED with the overall excursion and can&apos;t wait to do it again. A buoy attached to the SUB keeps everyone exactly 15 feet below the surface and your head remains dry. Our last port excursion at Freeport, Bahamas, offered a pleasant surprise. Our son had never snorkeled and is not a very good swimmer, but he wanted to try, so we booked an independent excursion through Viator to snorkel from the beach at Paradise Cove (Deadman&apos;s Reef). While my DH was helping our son learn how to use the equipment along with employees at the beach, I started swimming out to the reef. For a non-swimmer, it is a great distance and the equipment for flotation was not a vest, but a belt; our son did get to see a couple of small fish swimming close to the shore while standing on sand. It was low tide when we arrived and I had never snorkeled so close to the coral and fish as my underwater photos can attest to. I saw several turtles and a spotted ray probably 4-ft. in span with an even longer tail/barb, along with the usual assortment of fish and coral. For me, this was my best snorkeling adventure ever, due to the proximity to everything. Entertainment - For late diners, options for entertainment were minimal; we do not frequent comedians which seems to be a typical Carnival show. The 80s show was not good in our opinion. We also are not bingo players or interested in hairy chest contests, etc., so activities we enjoy were not plentiful. The Serenity Deck is too small for the number of people wanting to use it and when we ventured there, there were really no chairs available (some chair hogs, but not a lot). Also the hot tub could not handle more than 7 people. There were 15-20 children on board to attend the camps/clubs. There was a medevac on our last sea day which put us behind in time to arrive in Baltimore. 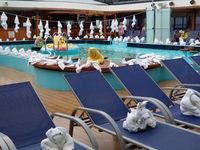 I never made it to the gym, but did enjoy a massage at a reduced price on the last sea day and I had purchased an OBC prior to sailing for our DIL to get a massage also - she enjoyed hers as well; however, we started to experience rocky seas and the spa is located forward on deck 9 (Lido). She experienced seasickness and did not go to dinner. Our arrival time was pushed back until 11 am into the port (I am sure the succeeding cruise experience at least a two hour delay with embarkation as well). We asked for wheelchair assistance for our DIL for debarkation, but were waiting until after 12:45 pm before being escorted off based on the location of cabin by deck - I found this to be a very unsatisfying way to disembark. Handicap assistance followed platinum/diamond pax, then FTTF, self-assist people, who took an hour total. Driving away from the port was very easy and we were on the road before 1:30 pm. Would I sail on the Pride again? - Probably if a different itinerary. Would I sail from Baltimore again - absolutely! Cabin was fine for two and for children using the 3rd/4th berths, but not four adults. Couch was not available to use as such and bunk was always down, making it crowded and uncomfortable. Getting to the port is easy as well as the parking and arrival at the entrance. Took small bus to other side of island for Deadman&apos;s Reef (at Paradise Cove) Snorkeling and Beach Escape. We arrived at low tide and snorkeling was a swim from the beach to the reef - 1/4 mi. Snorkel, fins & mask provided; flotation belt extra. Grand Bahama Island has sea turtles, rays, and many different fish and coral. Beach did not have a lot of sunbathers. Best snorkeling I have ever done due to low tide giving me very close proximity to the sea life. Hope to return there again. Took a bus to the other side of the island, where we got on a "speedboat" to go to the snorkeling boat with the SUBs on board. Group 1 went in the SUB first, then they snorkeled while group 2 were in the SUBs. The boat lowers the SUB into the water and the swimmer can keep head above water & enters into bubble (filled with air). SUBs have "steering mechanism" and have a rope with a buoy attached which keeps the SUB at 15 feet under the surface. Very fun and cool and can&apos;t wait to do it again. Good area near reef with many fish of different species and lots of coral too. We did the self-guided tour, but quickly realized that the relatively short time we would be there (7-8 hours) would only scratch the surface. To really see the Visitor&apos;s complex and other buildings, you need at least two full days. Definitely worth seeing. 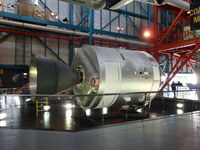 There is equipment from all the space programs: Gemini, Apollo, Space Shuttle, etc.